Wait… Did you read that right? What did you think the sentence was talking about? Careful… context is important. In most circumstances, the correct answer would be B. But have you ever read A Modest Proposal? Welcome to Evidence-Based Reading on the SAT. If you want to score high on this section, here are some study strategies you can put into practice! 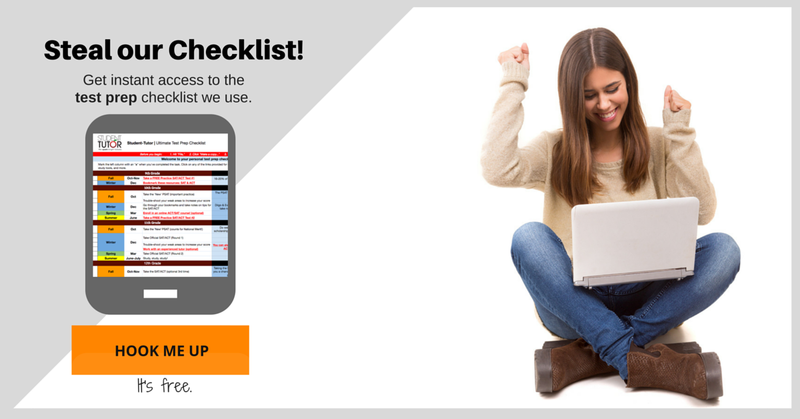 If you had FOREVER to take the SAT, you could probably get a perfect score every time. But your time limit for the Evidence-Based READING portion of the SAT is 65 minutes. In other words, you can’t exactly prop up on the couch with your favorite drink and a plate of crackers and leisurely read each passage… wouldn’t THAT be nice? But how will you know the context of a phrase or word without reading the words and phrases surrounding it? It’s a good idea to learn how to read strategically. Be careful, skimming is not the same as scanning. 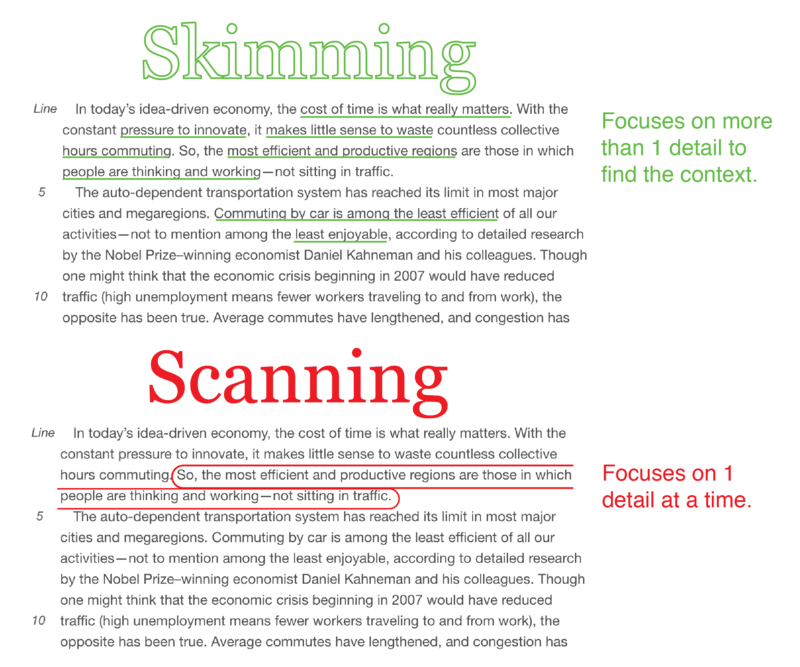 As the illustration above shows, skimming will allow you to look for important details in a bulk of text, while scanning will only focus on one. For context based questions in the Evidence-Based Reading section, you need to know more than just the phrase or word itself… singling it out is the #1 way you can misinterpret it! Knowing the questions beforehand will help you skim the passage for the details you need, rather than getting caught up in some story about Jane and her dog Skipper taking a walk on the beach. Truth is, you may only need to identify why Jane laughs at a seagull and that’s like, 3 paragraphs in. Once you’ve read the questions, break down the passage. OK, so you’ve read the questions beforehand and you know what you’re looking for. You need to know why Jane laughed at the seagull. Was it because she thought the seagull looked funny? Was it because it reminded her of when she was younger and carefree, playing on the beach? Was it because of something else entirely, and she was just absent-mindedly staring? 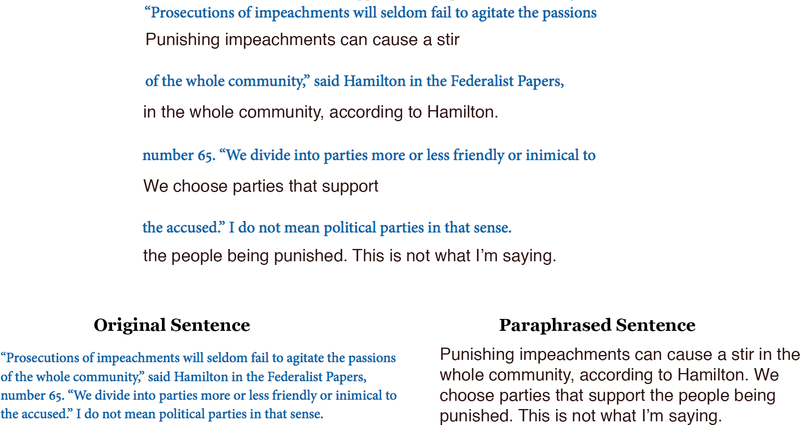 Find the actual sentence that the question is being asked about, and skim the surrounding area. It’s basically like you’re a detective that’s found the body, and now you’re looking around the room to see what other clues are left for how it got there — little morbid, sorry. But don’t you feel cool? Evidence questions are a little trickier than context, in my opinion. Woah. What did I just read? What the heck does “inimical” mean?? Take a deep breath. Elevated language (Words like “inimical”) can sometimes act as what I like to call “Reading Roadblocks”. What that means is that seeing a word we know in a complex sentence can feel like stubbing a toe — next thing you know, you’re second-guessing what you read and stumbling all over the place… test anxiety. We’ll get to talking about vocabulary in a second, don’t worry. First, let’s talk about how to answer an Evidence question on the SAT. Here are the questions for the passage I just showed you. To even begin finding the answer, you need to know how to break down complicated sentences like these into something that actually makes sense. 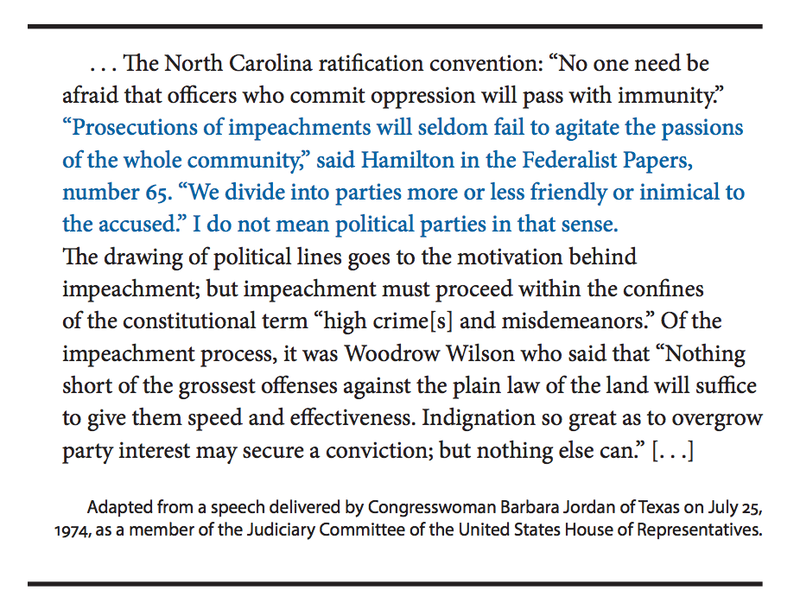 Do this: Try to paraphrase it. Now that you can better understand what the sentence was about, we’re going back to… you guessed it, context. So you can infer that based on the context, answer A. is the best answer. It’s also the correct one. Don’t let vocabulary trip you up. Make sure to check out ALL of Vocabulary.com’s SAT vocab lists! But this begs the question — what do you do when you encounter a word you absolutely do not know? But let’s suppose NONE of it is familiar? It’s some weird word with nothing recognizable: “I put the blezork in the fridge for later. ” Well, given the rest of the sentence – you’re putting it in the fridge – there’s a good chance it’s food. And it’s perishable. Or at least a medicine that you don’t want to go bad. If the next sentence says: “Don’t forget to take it after you eat today!” You’ll have your answer. Hopefully now you know a little more of what to expect and how to study for your SAT’s Evidence-Based Reading portion. Keep studying, and be sure to check out College Board’s sample SAT reading questions! Do you have any more questions about the Evidence-Based Reading portion of the SAT? Ask them in the comments below!